(Nanowerk News) The next generation of light-manipulating networks may take their lead from designs inspired by spiders and leaves, according to a new report from two Boston College physicists and colleagues at South China Normal University. Structures as commonplace as spider webs and leaf venation show they can lead to near optimal performance when copied to create flexible and durable networks that can be used in optoelectronic applications such as photovoltaic devices and display screens, the researcher team reported in a recent edition of the journal Nature Communications ("Bio-inspired networks for optoelectronic applications"). "Our idea is quite simple and far-reaching," said Research Associate Professor of Physics Andrzej Herczynski, a co-author of the report. "It starts with the premise that natural forms offer ready-made solutions for efficient designs, tested over millions of years through natural selection." A network design inspired by the vein-laced structure of a leaf served as an effective electrode for solar cells, light sources and transparent heaters, among other applications, the team reported. "This natural structure has been optimized through the evolutionary process for efficient nutrient delivery with maximal strength and light harvesting," said co-author Boston College Professor of Physics Krzysztof Kempa. "In our application, these properties translate into highly efficient current transport, desirable mechanical properties, and minimal light shading." A second network, drawing on the same designs that make spider webs effective traps for insects and bugs, serves as an efficient way to draw light through an optoelectronic device. 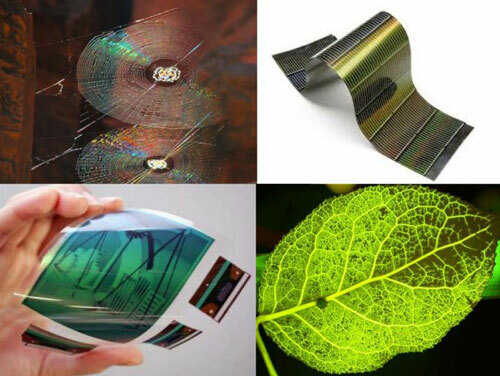 The network could find potential application in next generation touch screens and display panels because of its extreme flexibility, significant mechanical strength, "stealth" transparency and high degree of uniformity, the researchers said. One of the primary advantages of these two proposed methods is the low cost and simplicity of the manufacturing process. The researchers said they were surprised by the superior performance of the networks in experimental scenarios. Both delivered a four-fold increase in electro-optical properties, or the benchmark figure of merit. Furthermore, the spider web design network can be stretched by up to 25 percent without any loss of performance and sees only a minimal decline when stretched up to 100 percent of its original size, the team reported. "No other electrode network can be stretched more than 10 percent," said Kempa. Other members of the research team included University of Houston Prof. Zhifeng Ren and South China Normal University Prof. Jinwej Gao and his research team. The researchers say the specific network patterns they have proposed could improve the efficiency of solar cells and the performance of a new generation of flexible, durable touch screens and displays. "Increasing efficiency of solar cells, in particular, is a critical component in the quest for renewable energy sources, a major sustainability and ecological challenge," said Herczynski. "Flexible monitors and displays will likely become increasingly important for such possible uses as wearable screens and elastic smart phones."